If you're like most people, chances are you'd like to have more wealth and abundance in your life. And if that is the case, I have very good news for you, because achieving financial success is much easier than you think. The reason why most people haven't yet attained the wealth they seek is because they don't have a positive money consciousness -- too often, they're limited by their own beliefs about money and by the question of whether or not they deserve it. "You need money to make money." These negative beliefs about money are usually picked up in childhood and find their way into your subconscious. They can sabotage your financial success, because they subconsciously emit a vibration that cancels out your conscious intentions. However, there are a few simple steps you can take that'll turn around your limiting beliefs about money, and put you directly on the path to wealth and abundance. One way to do this is by creating a positive turnaround statement. For example, you can say something like, "Money comes to me in unforeseen ways," or, "I now have more money than I need to do everything I want to do." Another way is to include money in your daily visualizations. Constantly fill your mind with images of what you want and picture yourself already having it. See images of your ideal bank account balance, the things you'd like to buy, the places you'd like to travel to, and the freedom that having wealth brings. Just remember this, the first requirement to becoming wealthy is to make a conscious decision to do so. Decide now from the deepest place in your heart to have wealth and abundance in your life. Before you know it, your subconscious will work to attract the people and resources needed to help you reach your ideal monetary goal! 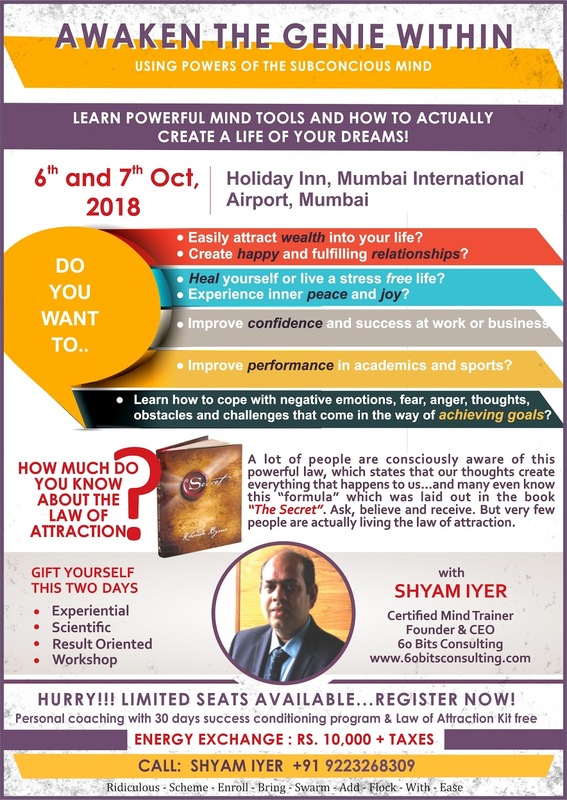 In our signature workshop “Awaken the Genie within” on Oct 6th and 7th at Holiday Inn, Mumbai, you'll discover how to develop a positive money mindset and attract the wealth and abundance you've always envisioned for yourself. 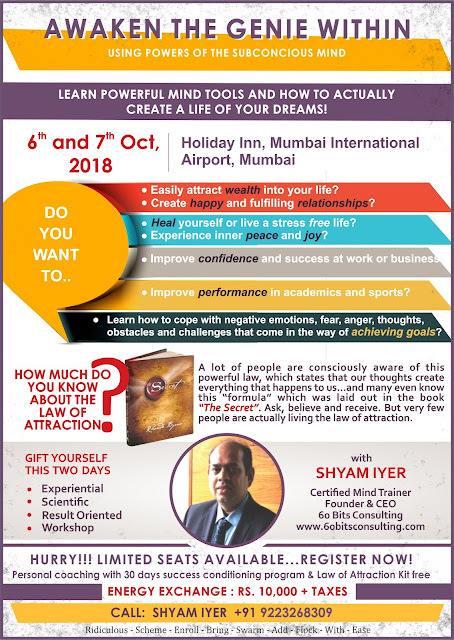 This couldn’t be more true: if you wish to receive the wealth and abundance you want, then you must attend the two days life transformation workshop.